There are many ways you could go about filling your home with connected devices. You can pick a standard like ZigBee or Z-Wave and stick to it. You could try looking for anything that mentions SmartThings compatibility on the page. Or you could buy all of your products from a single company. That's the approach LG would like you to take. Like Samsung, LG has produced fridges, kitchen ranges, washing machines, and dryers with touchscreens and "smart" features. At this year's CES it's introducing a new hub that can help you keep up with those appliances. The SmartThinQ Hub (SmartThinQ being the name for LG's smart home ecosystem) is an Amazon Echo shaped product with a 3.5-inch screen on top. It can show the time, keep up with the weather, and broadcast notifications. Using a companion app, you can control your LG washing machine and refrigerator without having to walk over. Since LG doesn't make everything, the SmartThinQ Hub lets you control devices connected to SmartThinQ sensors (pictured above) via Bluetooth, Wi-Fi, and ZigBee. This lack of Z-Wave support makes the product not quite as versatile as Samsung's upcoming Smart TVs. 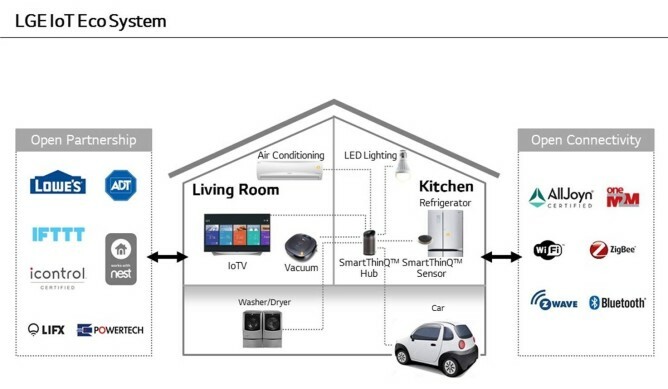 Still, LG's hub will also support the AllJoyn Alliance open source framework and Lowe’s Iris smart home services. It will presumably be cheaper than a new TV as well. How it compares to the 2nd gen SmartThings Hub remains to be seen. SEOUL, Dec. 30, 2015 — LG Electronics (LG) will unveil its newest addition to its IoT ecosystem, SmartThinQ™ Hub, at CES 2016. 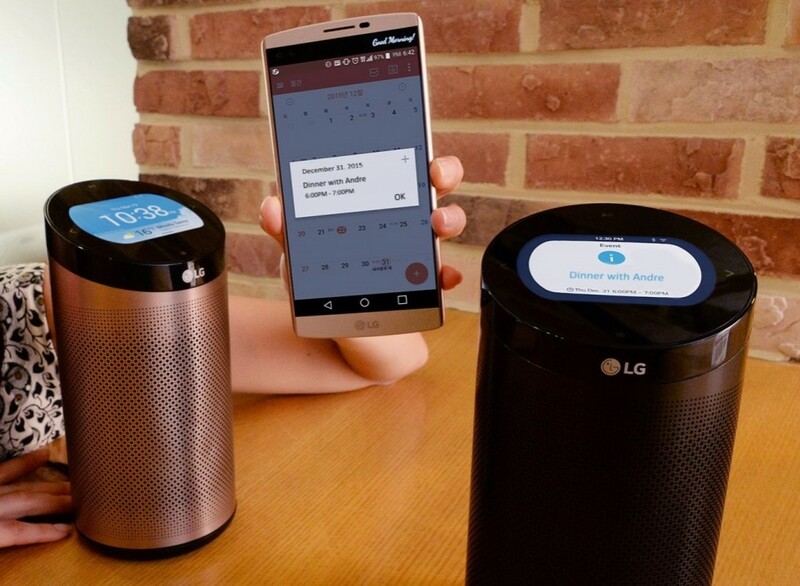 LG SmartThinQ Hub serves as a gateway to smart sensors and connected appliances in the home but is more than that, with the ability to display reminders from personal calendars and stream music from its built-in speaker. 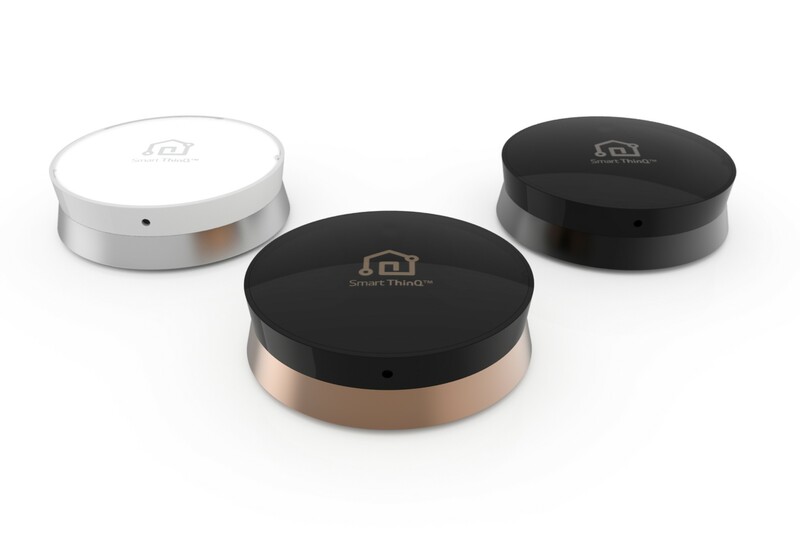 The elegantly designed SmartThinQ Hub includes a 3.5-inch color LCD display and connects to a smartphone app to facilitate two way communication with smart appliances and smart sensors in the home. The SmartThinQ Hub expands LG’s SmartThinQ platform to monitor and control home appliances such as washing machines, refrigerators, ovens, robotic vacuum cleaners, air conditioners and a variety of sensors. The SmartThinQ Hub plays a central role in LG’s smart home platform by collecting information from smart appliances as well as conventional devices connected to SmartThinQ sensors via Wi-Fi, Zigbee and Bluetooth. Data is displayed in the form of notifications on the LCD screen or announced through its embedded speaker, acting as the central “hub” of the smart home. As like all other LG home appliances and consumer products, the LG SmartThinQ Hub is designed to look great in the home. The unit features a metallic body in two attractive color schemes: Champagne Gold and Black. The LCD display is tilted at an angle to be easily readable and the high-quality speaker can stream music from thousands of free stations from iHeartRadio or play whatever is on a smartphone or tablet via Bluetooth. The SmartThinQ Hub is compatible with a number of devices from other manufacturers and service providers that support the AllJoyn® Alliance open source framework. LG recently formed a partnership with Lowe’s, the world’s second-largest hardware retail chain, to integrate LG’s smart devices with Lowe’s Iris smart home services. LG’s partnerships with other service providers are a key advantage of LG’s smart home system, which prioritizes compatibility across multiple brands. Such partnerships allow LG to offer packaged bundles that enhance safety, energy savings, air care or convenience that might include a SmartThinQ Hub, a SmartThinQ sensor and a variety of smart appliances and devices from other manufacturers such as smart lighting, motion sensors and moisture detecting sensors. The LG SmartThingQ Hub, SmartThingQ sensor and other intelligent products from LG will be on display at Central Hall Booth #8204 of the Las Vegas Convention Center from January 6-9. For more information about LG products at CES, please visit www.LGnewsroom.com/ces2016.